A Catholic charity is reaching out to people of all persuasions, buoyed by a bumper donation from the Tamworth Co-operative Society and its shoppers. 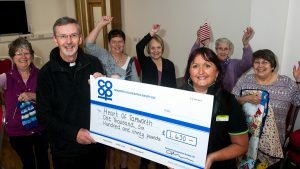 Members of Tamworth Central WI cheer as Julie Clark, manager of the Tamworth the Co-op supermarket, presents the Community Dividend Fund cheque to Father Michael White. The WI group is among the organisations using the new St John’s Community Centre. Customers at the Co-op’s town centre supermarket have raised £1,630 for Heart of Tamworth by giving up the dividends earned on their purchases. The money, from the Society’s Community Dividend Fund, will help pay for a lift allowing disabled access to the upper floor of a new meeting place in St John Street. St John’s Community Centre, attached to St John the Baptist Catholic Church, hosts a range of activities organised by the charity, as well as providing a refuge for the needy. Around half a dozen rough sleepers were the first guests to be offered the hand of friendship at the centre when it opened in March 2017. They stayed overnight and were given food as part of a church co-ordinated winter night shelter scheme. A number of local organisations are now also using the building in the former sacristy for their meetings. They include a WI, groups for people with learning disabilities and addiction problems, along with luncheon and stroke clubs. Parish priest Father Michael White said: “Tamworth Co-op and its shoppers have been great to us. This is the second substantial donation we have received recently from the Society and we’re very grateful. “Our vision is to serve the wider community and this building is allowing us to do that. We have lost a lot of meeting places in Tamworth and people are now coming here because it is central. It’s about helping those in need too. The problem of homelessness is a growing one and we plan to hold another winter night shelter here next year. The community rallied to assist with the building work for the new centre which has two kitchens upstairs and downstairs. Several companies and volunteers – from within and outside the church – provided materials and labour for free. In January, Heart of Tamworth received £5,000 from the Co-op Cash in the Bag initiative, funded by the Government’s 5p charge on plastic shopping bags.